One of the really useful things about publishing documents in a structured way is that we can treat the document as a database, or generate an outline view of it automatically. Whilst looking through the OU Structured Authoring XML docs looking for things I could reliably extract from them in order to configure a course custom search engine (Notes on Custom Course Search Engines Derived from OU Structured Authoring Documents), I put together a quick script to generate a course mind map based around the course structure. Downloading the XML files for each of the T175 derived modules on OpenLearn into a single folder, I put together a quick script to mine the structure of the document and pull out the learning objectives for each unit, as well as the headings of each section and subsection. 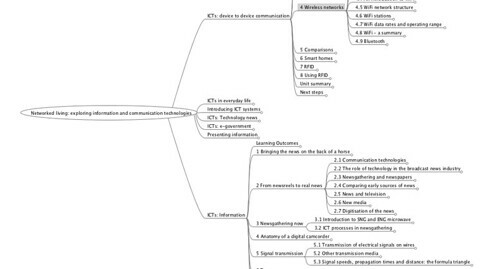 The resulting mindmap provides an outline of the course as a whole, something that can be used to provide a macroscopic view over the whole course, as well as providing a document that could be made available to people following the unit as a resource they could use to organise their notes or annotations around the unit. Here’s a copy of the Python script I ran over the folder to generate the Freemind mindmap definition file (filetype .mm) based on the section and subsection elements used to structure the document. #We probably need to bear in mind escaping the text strings? 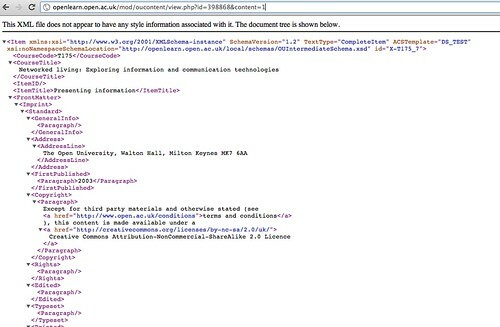 If you try to run it over other OpenLearn materials, you may need to tweak the parser slightly. For example, some documents may make use of InnerSection elements, or Header rather than Title elements.